Everyone who has his/her website online wants to see how their website is performing. Google is a name we are all familiar since we started using the Internet. They have a measurement tool called Google Analytics which helps in growing our websites through Data Collection and Analysis. So I wrote a simple step by step guide to set up an account at Google analytics. 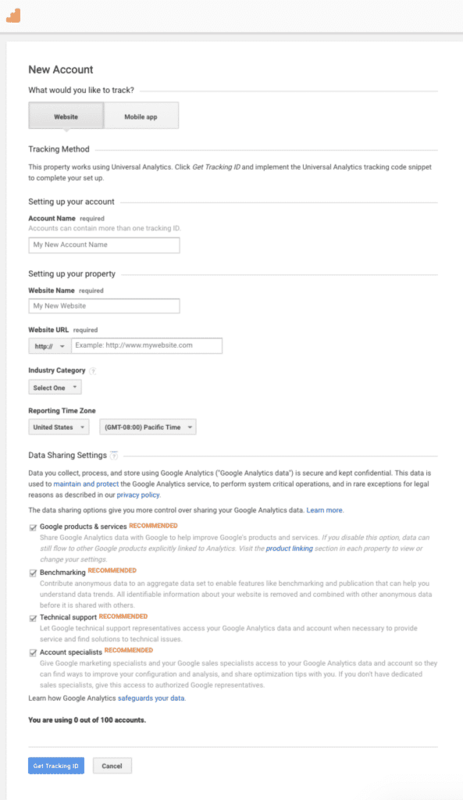 These instructions are for everyone who wants to use Google Analytics on their websites. You will see a screen like the one below. If you already have a Google or Gmail account, then you can use that to sign-in. If you do not have a Gmail account, then you would have to create an account for Gmail first and then come back to this Google Analytics page. Step 2: Once you sign-in with your Gmail account, you will be prompted to a screen like the one below. This is where you will signup for Google analytics with your Gmail account. You will see this screen first time only since you are setting up Google analytics account. 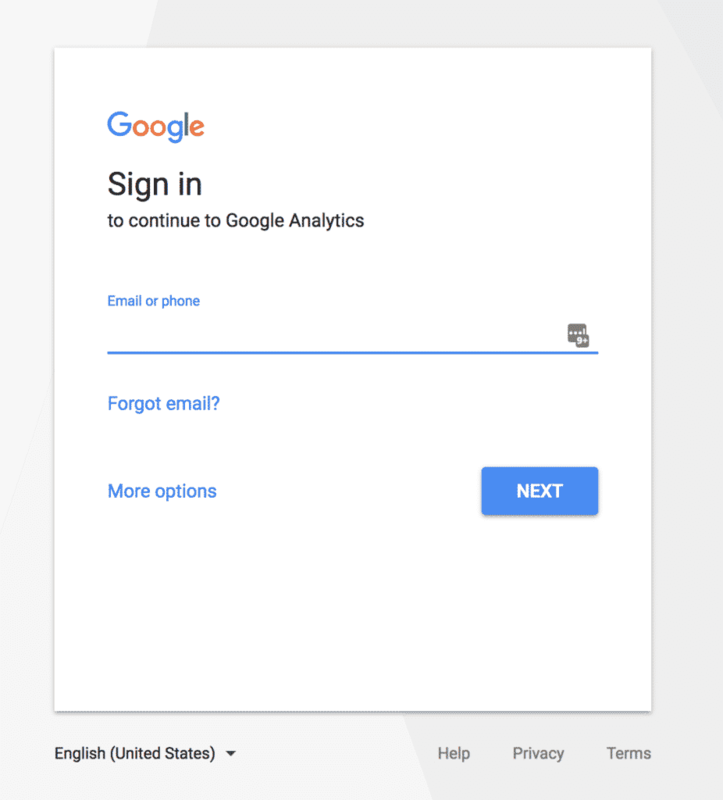 Once you sign up, you will use the same Gmail account for sign in at Google Analytics. Following fields are to set the Property. One Property is for One Website. Website name, website’s URL, country, and the time zone. Note: You need to understand Account, Property, and Profile terms here. These terms will be used heavily and will be used in the future if you want to use Google analytics at an advanced level. Once you have entered this information, click on the Get Tracking ID button. 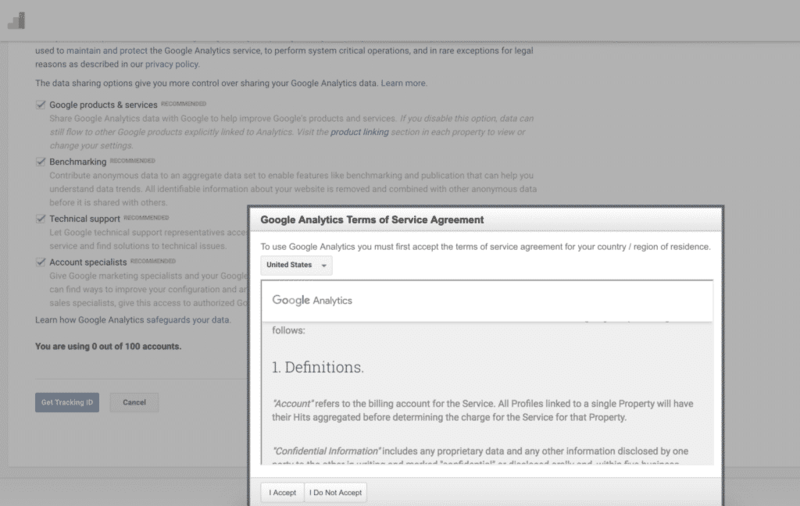 You will be presented with Google Analytics terms and service which you must agree to, so click on I Accept button. 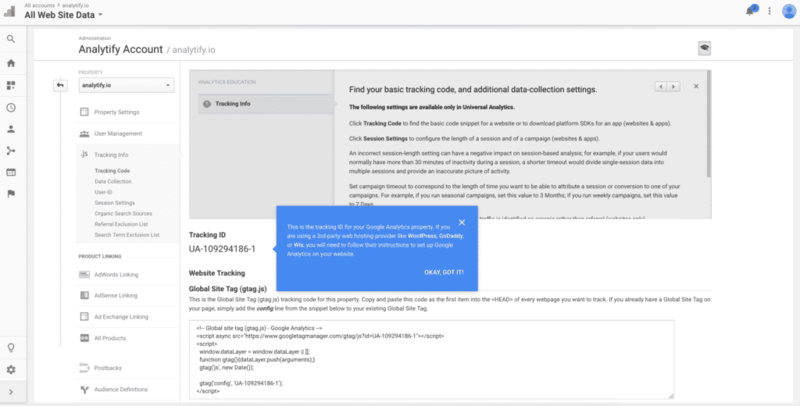 Step 4: Now you will be presented with your Google Analytics tracking code. You can copy this tracking code because you will need to enter it to your site depending on the method you use below. Step 5: If you are using Analytify, then no need to copy this JS code. Just go to Analytify plugin settings and Authenticate it again by using your Google Analytics username and password. After authenticating you will see a website (property + profile) in dropdowns of Profiles for posts and dashboards. If there are any questions related to this guide, feel free to post them below in comments. goodday, i was able to update my analytic account but its still not showing on my analytify dashboard. am still getting this issue : No Website is registered with your Email at Google Analytics. Please setup your site first, Check out this guide here to setup it properly. please how can i solve this? After updating your account at Google analytics, you should log out from Analytify and Authenticate it again. Same problem this my installation attempt. 12/24/18. Everything checks out on Google Console but Analytify plugin does not recognize matching gmail account. I have logged out and back in then waited several minutes as plugin message indicates. I was also logged out of plugin before creating API key. I went through all the steps, but it’s not showing up as an option in anilitify under dashboard. It’s saying I need to authenticate it, which I did, but I don’t have the option to choose my site under the drop downs. They’re blank. I don’t know what to do next for it to connect on my site. I don’t see a log in anywhere… in fact where there is one it says do I want to log out… I’m really confused. Somehow you missed a step in setting up your site at Google analytics. I would recommend to go through the steps again mentioned above, logout from Analytify plugin and Authenticate again. If the problem persists, please contact us at https://analytify.io/support/ and submit your Google Analytics user/pass along with diagnostic logs from Analytify plugin. Our support team will resolve this issue for you! I had the same issue. Did you figure out how to fix it? Thanks to the analytify team, this problem was due to access restrictions in Iran. Google Analytics is all set up with the email above and the website MealsByMom.com. No Website is registered with your Email at Google Analytics. Please setup your site first, Check out this guide here to setup it properly. Same issue as everyone else above with “no website” even though it is in fact registered…any fix? Answered my own question…including here in case it helps anyone else as this seems to be a common issue and isn’t covered in this help guide. Simply setting up your website in Google Analytics isn’t enough. You also need to enable the Analytics API. Step 1: Log into your developer console “https://console.developers.google.com/”. You should be redirected to the API dashboard “https://console.developers.google.com/apis/dashboard”. Step 2: Click the “Enable APIS and Services” button just below the header at the top of the page. Step 3: Search and select the “Analytics API” in the “API Library” page that opens. Step 4: Select the enable button on the next page. Step 5: Return to the Analytify dashboard in wordpress, log out of the google authentication and then log back into reauthenticate. And viola, you should be in business!! After installation of plugin it gives an error of setup google analytics account. I have already signup with google analytics but still it showing the same error. can you help me in this regard. I cannot login into the analytics account why?? ?